Study in Australia by international students is Australia’s third largest export, ahead of iron ore and coal. 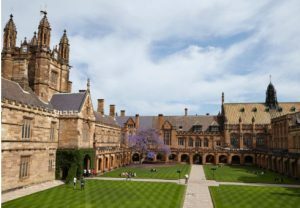 Study in Australia is most popular across universities and other tertiary institutions where international education generated $13.7 billion over the past 12 months. More than 320,000 students from 130 different countries are currently studying at universities across Australia such as the award-winning Sydney University (pictured). The international education industry supports more than 130,700 Australian jobs, according to the Australian Bureau of Statistics. “Australia is a destination of choice for overseas students,” says Darrell Todd, founder of thinkingaustralia. “More and more students are choosing to study Down Under because Australia has it all – high quality world-class education; an outstanding student experience; great weather and a rich culture. Spending by overseas students in Melbourne currently generates $888 million in indirect revenue in regional Victoria and supports 5,478 regional Victorian jobs. International students also make a big contribution to regional communities with around 5% of all overseas students living and studying in regional areas.